PLEASE do not hesitate to call and ask for the sacrament of the sick. Even at the onset of an illness, you can and should call for a priest. This sacrament is a sacrament of healing! 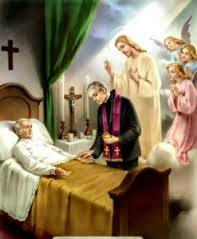 According to Canon Law, “the anointing of the sick may be administered to the faithful who have the use of reason and begin to fall into danger as a result of illness or old age. Great care and concern should be taken to see that those of the faithful whose health is seriously impaired by sickness or old age receive this sacrament. If you or a loved one is home-bound or in a nursing home, you should be receiving Holy Communion weekly. Please contact the parish office at (912) 356-6980 to set up a weekly visit by one of our Eucharistic Ministers. If you would like Communion brought to someone who cannot attend Mass, please contact the Parish Office. The death of a loved one is a stressful time. When someone you love dies, please call the parish office immediately to make plans for the Funeral Mass. The Mass is the most powerful prayer in the Catholic Faith and we want to pray for the happy repose of the soul of our beloved dead and for the consolation of their families. Our ordinary practice is to have a wake with a rosary or Scriptural vigil service at the funeral home the night before the funeral. The funeral mass will be celebrated in the parish church, with interment and blessing of the grave to follow at the cemetery. If you desire different arrangements for special circumstances, just communicate these to the priest. May God bless you and be with you in this time of grief.